I adore to find new designer products and search how they look in real interiors. My inspiration goes to x benches in this post. They are cute, beautiful and stylish. I can’t even imagine the design where they won’t fit. The small bench is an easy way to freshen up the room. Here are my top favourite ideas using them in interior designs. Angela Cunha. Blanco Interiores – supposed to be a foyer, but I think more of a bedroom look. Love the horizontal paneling and the lamps and mirror. Blue and white patterned lamp, clear acrylic console table, blue and white tufted stool, and gold mirror. 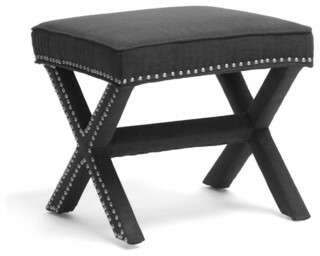 Cowhide X bench as an ottoman or use as a small bench in a walk in closet. good arrangement to add extra seating, lighting, storage in small area of living room or entry. La Fiorentina chair, West Elm Jackson sofa, coral x-benches, and layered rugs. Simpe and lovely main entry decor. upholstered x benches and this is an afforable way to personalize them. Marine Gray has wonderful Linen Modern Bench. Coaster Home Furnishings presents the contemporary bench with crossing silver legs and white faux leather cushion. The red one is adorable. It will perfectly suit any girlish design. I would place it in the walk in closet or under the console in the etrance area. Oh, and it will defininely be gorgeous as an office chair.